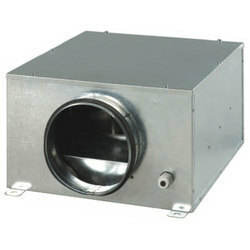 Leading Manufacturer of caryaire rectangular insulated inline fan from Noida. Application: CRIOF fresh air fans design gives opportunity to use them in intake or exhaust air ventilation systems in the applications where noise level are more concerned and restricted space for mounting. For example, it is possible to place it directly over the counter ceiling in the premises. It is intended for mounting with air ducts with diameter of 100, 125, 150, 200, 250 and 315 mm. Design: Fan casing is made of galvanized steel sheet insulated with polyurethane foam which is having good sound absorbing and moisture resistance features. Connection pipes of circular section are equipped with rubber seals. Motor: Two-pole induction motors with external rotor and impeller with backward curved blades is used. Motors have built-in heat protection with automatic restart. Due to the application of the motor with ball bearings, with selective lubricating oil the low-noise fan operating regime, which requires no servicing, is guaranteed. The motor is mounted on the rubber isolators inserts in order to reduce vibrations. Speed control: Speed control can be achieved with thyristor controller. RPM is changed by achieved changing voltage. Air quantity changes according to the change of motor RPM. Several fans can be connected to one control device provided that the overall power and operating current will not exceed the nominal parameters of the controller. Looking for Caryaire Rectangular Insulated Inline Fan ?